The ZyXEL MES3500-24/MES3500-24F has been specially designed for service providers to deliver profitable Ethernet services. With the high-performance hardware platform, service providers can easily extend network topologies while enabling robust security, QoS and management functions to help customers fulfilling different needs and to support the IPv6 for trouble-free future network expansions. Consistent service quality and reliable connecting ability in a converged network is the key for Carrier to connect and satisfy customers; therefore the ability to control traffic flow and set traffic policy becomes more critical than ever. 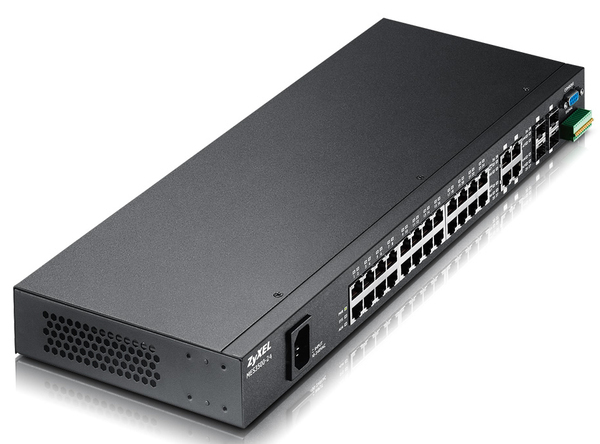 The ZyXEL MES3500-24/MES3500-24F 24-port FE L2 Switch offers wire-speed flow control that classifies and prioritizes the incoming packets according to the predefine QoS policies that meet requirements of service providers. In terms of classification, the Differentiated Services Code Point (DSCP) field and the 802.1p Class of Service (CoS) field are identified to assess the priority of incoming packets. Classification and reclassification can be based on criteria as specific as rules based on IP, MAC addresses, VLAN ID or TCP/UDP port number. For bandwidth management, the MES3500-24/MES3500-24F provides 8 priority queues per port for different types of traffics, allowing service providers to set policy-based rate limitations that take full advantage of constrained network resources and guarantee the best performance. Avoiding subscribers affecting each other on a shared network or shared device is a major concern for service providers. The ZyXEL MES3500-24/MES3500-24F offers a complete set of security features to protect user data while administrating the traffics. Port security provides the ability to deny unauthorized users from accessing the network. Moreover, the 802.1X feature cooperating with RADIUS is useful to prevent unauthorized access based on username and password (or other credentials) and acts as powerful access control for converged networks with mixed wired and wireless access. The MES3500-24/MES3500-24F provides a multilayer (L2/L3/L4) ACL suite of sophisticated policy-based control mechanisms that enables service providers to deploy easily based on actual network environment needs via a Web GUI or command line interface to prevent abnormal or illegal access. The policies can be defined to deny packets based on source and destination MAC addresses, IP addresses or TCP/UDP ports. A quick recovery and round-the-clock network is vital for service providers to establish a robust network. 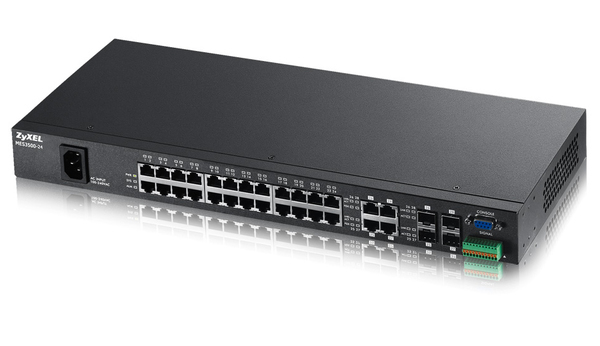 The MES3500-24/MES3500-24F provides comprehensive features to make sure network is well operated. The IEEE 802.3ad Link Aggregation feature reduces network downtime by providing redundant paths and bandwidth aggregation to critical connections, while IEEE 802.1w Rapid Spanning Tree Protocol (RSTP) and IEEE 802.1s Multiple Spanning Tree Protocol (MSTP) allow immediate recovery from failed connections by sending packets via the backup link. The enhanced digital interface allows real-time access to the device operating parameters, and it includes optional digital features such as soft control and monitoring of SFP I/O signals. In addition, the MES3500-24/MES3500-24F fully incorporates the functionality needed to implement digital alarms and warnings from fault isolation and failure prediction tasks as well as component monitoring features, among others. With the digital diagnostic monitoring interface, the MES3500-24/MES3500-24F enables users to easily detect packet loss from transceivers and aging cables; therefore users can not only avoid troubles such as unstable networking services, but also boost productivity significantly. As ZyXEL considers IPv6 management features as a future trend, complete IPv6 host management capabilities are added to the MES3500-24/MES3500-24F for guaranteed IPv6/4 migration and future-proof expansion. It’s not only beneficial for high-density Fast Ethernet deployments, but also capable of preventing investment loss and therefore perfectly suitable for both network cores and edges.